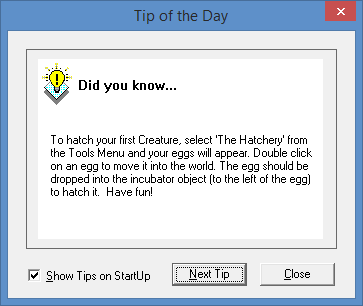 To hatch your first Creature, select 'The Hatchery' from the Tools Menu and your eggs will appear. Double click on an egg to move it into the world. The egg should be dropped into the incubator object (to the left of the egg) to hatch it. Have fun! You can use the right mouse button to pick up and drop objects. These creatures are genuinely ALIVE! Please look after them carefully and treat them with respect. You can repeat whatever you last said by pressing Ctrl-S.
You can smack your norn by clicking on its body and tickle it by clicking on its head. This is one way to punish or reward its behaviour. Make sure your norn has plenty to eat - a well-fed norn is a healthy norn. You can pick up many objects by clicking them with the right mouse button. Click again to drop them. You can often make an object work by clicking on it with the left button. If you want your norn to pay attention to an object, you could try picking it up and waving it in front of his nose. Later, you might teach him its name and talk about it instead. All the objects in Albia are sorted into categories - lemons, carrots, honey and cheese are all in one category, and they can all be called - 'food'. If you type the name of an object when your norn is paying attention to it, he will probably learn to associate that word with that object. There are many things you can do using the various 'kits' supplied with this program. The kits can be opened using the Tools menu or the toolbar. Some kits are only useful at certain times. Do you think your norn may be pregnant? Open up the Breeder's Kit from the Tools menu to help find out! In the Breeder's Kit, the red X on your male norn means that he is unable to become pregnant. Don't worry, he can still father a child! You can probe into your norn's brain and study his biochemistry using the Science Kit. Is your norn looking unwell? Open the Health Kit to try and find out what's wrong, and maybe put it right. If your norn's health is under 15%, five 'Energy' injections from the Health Kit will help the norn. Keep your norn active and amused. A bored norn can develop serious mental problems. There is no verb 'eat' in C1, so if you want to tell your norn to eat, say: "Push food yes". Norns often like music. If they don't learn to play an instrument, they might appreciate some being played for them. Is your norn lonely? Hatch him a friend to play with. The incubator closes and the import option becomes unusable when the population is at 8 norns or above. The maximum population limit in a world is 12. Norns are capable of real evolution. After many generations, nobody knows how the species might develop! An oddly behaved norn might be suffering from a congenital defect, maybe brought about by a genetic mutation. Do not let him breed. See the next tip for humane approaches to euthanasia. A humane means of euthanasia that I use is: ensuring all the needs of the norn are met, exporting him (naming the file 2recycle), and using the recycle bin. If you have bred (or educated) a norn with interesting characteristics, we'd be very interested to hear about it. Broaden your norn's horizons! Encourage him to travel. Can you and he completely circumnavigate Albia? When using vehicles the word "PUSH" makes the vehicle go right whereas the word "PULL" makes the vehicle go left. When using a lift, the word "PUSH" makes the lift go down whereas the word "PULL" makes the lift go up. The 'world' your norns live in is called Albia, named after Albion, an ancient name for the island of Britain. The word 'norn' comes from ancient north-west European mythology and refers to the three old women who sit round a giant tree spinning men's fates. Norns are not the only kinds of creature on Albia. Have you met any of the others? The green lizard-like creatures that pop up are called Grendels. The Truth About Grendels has more information about them. It is worthwhile teaching your Grendel to talk - they often live longer than norns. Look on our Web Site for free add-ons! If you find a place in Albia that you might want to return to, store it in the Favorite Places list on the Camera menu. The camera will track your norn automatically, but you can scroll a little distance to either side using the scrollbars. If you've used Favorite Places to look at a distant location, you can return to your current norn by clicking the 'camera' icon on the toolbar. You can pay your respects to the memory of dead loved ones by opening the Funeral Kit and writing an obituary. The name of the first ever living norn was 'Ron' (may he rest in peace). The first norn ever bred in captivity was called Cain, son of Ron and Eve. He was born on March 21st 1996 at 10:50am. You can trade norns with your friends. See Help for details. True love cannot be forced, but there's no harm in a little match-making! Open the Breeder's Kit for some useful aphrodisiacs! Not all edible things are good for norns! Some are toxic, unless taken under medical supervision! Norns need their sleep! Try not to disturb deeply sleeping norns - their dreams are an important part of their mental development. It's worth putting a little effort into understanding Albian biology. It will help you to know what's going on inside your pets. If you're not sure how to treat your norn, think of him as a two-year-old child and you won't go far wrong. Using your norn's name when you tell it to do something usually gets a better result. Norns are usually very inquisitive (often too much for their own good). A norn that shows no curiosity might be sick. Give your norn a relaxing vacation! A free 3rd-party location is Terra Nornia. Norns change their attitude as they grow up. What suited an infant may insult or bore an adult. However, the ball is always a favourite. Norns cannot breed until they've reached puberty. Use the Breeder's Kit to see if they're ready. Norns are set to take over the world! This 'species' is just the first one we've released to the public, but we are working on breeding new varieties with different characteristics. Many of them have practical applications. You've not seen the end of this! Norns can contract viruses, but don't worry - these are NOT 'computer viruses'. Your data is quite safe! Artificial Life is a profound concept which should cause us to re-evaluate our moral and ethical attitudes! Where do norns go when they die? There's nothing a hot or tired norn likes better than a good shower. If your norn is fretful or listless, they'll find the warmth of the kitchen fire and the ticking of the clock very soothing. Your computer cannot cope with large numbers of creatures. Try not to over-populate Albia or things could start to slow down! Norn brains contain around a thousand neurons. Human brains have about 1,000,000,000,000! Don't expect norns to write symphonies! If your computer belongs to the whole family, then why not let everyone have a world of their own to look after? For young children, looking after norns can be a good introduction to pet-keeping. And you don't have to clear up the mess! You don't have to teach norns your own language. Perhaps you could learn the basics of a foreign language together? Norns have been known to learn words from each other, although occasionally they get a little confused about how to apply them. Because norns inherit their characteristics from their parents, you can try to 'breed in' desirable features by careful selective breeding. Can you breed a supernorn? Norns inherit their brain structure, biochemistry and many other factors from their parents. During reproduction, occasional mutations may occur. Many of these will be harmful or even lethal. However, some may turn out to be beneficial. Who knows what might evolve? Have you run out of norn eggs? Well, shame on you! Look on our Web site or write to us to find out how to replenish the supply. Next time, make sure you breed a few and look after them! Artificial Life is NOT the same as Artificial Intelligence. Norns can't play chess, but they ARE alive! The behaviour of norns is NOT 'programmed into' the system. What the program does is construct a 'model' of a real body and brain. We have very little control over the behaviour that ensues (as you've probably guessed by now)! We have found that the first few minutes of a new norn's life can be critical in establishing the path of its future development. Regular medical checkups are a good idea. Use the Health Kit to check heart condition and other general health signs. If you want a norn to travel in a lift and he won't choose to do so himself, get him standing in front of it and press the button yourself. When two norns get together, they can sometimes be hard to separate. Try distracting one's attention with food while you manoever the other into a lift. Norns are not tremendously sophisticated users of language. Commands such as "get toy" or "Ron sleep" usually work best. If your norn won't do as he's told, maybe you haven't given him enough schooling. To have multiple worlds, close Creatures, copy the file Eden.sfc, name the copy something like sistersworld.sfc, then rename World.sfc to yournameworld.sfc, name sistersworld.sfc to World.sfc, and let your sister start up! If a creature walks obsessively left, he/she is too hot, if a norn walks obsessively right, he/she is too cold. A COB is a Creatures OBject, a special file that creates a new object in Albia. Be sure to read any readmes that come with the object! When downloading a COB, unzip the .zip file with Winzip or similar to your C://Program Files/Creatures folder. All .spr files need to go in the images subfolder, all .cob, .rcb, readme files go in the main Creatures folder, all .wav files go in the Sounds subfolder. When downloading a norn, unzip the .zip file with Winzip or similar, and put the .exp file into your C://Program Files/Creatures folder. Keep a shortcut to C://Program Files/Creatures on your desktop for easy COB and norn downloading! Free upgrades to Creatures available are: Creatures Update 2, (version 1.02) Creatures Update version 1.04 for Win 9x and NT, the Injector Kit, the Observation Kit, the Purple Mountain Norns, the Christmas Packs 96 and 97, Object Pack 1, and Object Pack 2. Life Kit #1 for Creatures (which contains v.1.03) is also free as of Christmas 2003. You can alter and add to your startup tips by opening the file called Tips.txt in C://Program Files/Creatures. Genetically enhanced norns and grendels are available for download. Close to a MILLION copies of Creatures have been sold world-wide according to Mindscape. If all the Creatures owners from all over the world were to hatch their six eggs, then the Norn population would be over 3 million. If these six Norns breed, then the offspring would exceed 6.75 million after just 3 generations. Estimation is that 25 million Norns have hatched and experienced life! All from the first, Ron. The Official Creatures Deluxe Manual in PDF format. This page was last modified on 16 September 2018, at 20:59.